Wash your windows with a fresh cleaning technique that has met the demands of over 94% of our customers in Finsbury! A: Your panes will be polished by a team of certified and background-checked window cleaning specialists. Q: What services does window cleaning Finsbury cover? 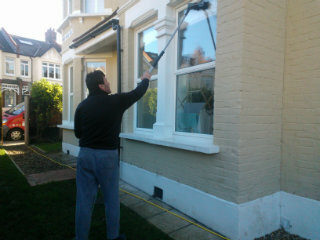 A: The experts will achieve exterior window cleaning with the help of the latest water-fed pole equipment on the market. For properties above the fourth storey, we'll dispatch experienced abseilers for rope access window cleaning. For internal pane polish, the team will use standard ladders and sponges. A: A couple of of raindrops won't undermine the Finsbury window cleaners' work – rainwater is usually mud-free. However, if we face a cloudburst, then we will kindly ask you to suspend your session for another day. A: As long as the team can enter your front gate, they can rinse away all grime without you having to be present. If your panes need a proper inside polish as well, then we'll arrange a fast key pick-up and delivery service. A: Usually, the distilled water container inside the team's cleaning vehicle is always full. In case the tank is empty and with your permission, the cleaners can painlessly attach the water-fed rod to any unoccupied water source. A: Once we inform you that the team's on their way, you'll need to make certain that they can enter your domain unimpeded. In addition, the technicians will require a parking space within 30 metres from your property and on the same side of the windows you want cleaned. A: If the team is nowhere to be seen because of intense traffic, we will inform you about the hold-up and get in touch with you as soon as they arrive. With the intuitive water-fed pole gear, the professionals can help you outshine your competition at reasonable rates. And you can lower our window cleaning Finsbury rates even further by merging two or more of our cleaning services together! To find out the exact amount behind our price offers, make sure to browse our convenient price table below. No matter where your stains have taken shelter, our capable window cleaning in Finsbury will repel them with ease. We have encompassed various cleaning methods. Our exterior window polish is suited for properties that do not exceed four storeys. To let the sunlight back inside, the window cleaners in Finsbury will come in a caravan, supplied with an extendible water-fed pole. This equipment is attached to a water container, filled with distilled water. After being ejected as a powerful gush from the pole's brush-head modification, the water will absorb all blemishes in an attempt to renew its previous structure. To reach smudgy window corners of high-rise structures, we'll send a proven team for rope access window washing. These approved abseilers will employ well-maintained ropes and harnesses or position ladders and cherry pickers to bring back the appeal of your panes. We've got all essential COSHH records in place and follow each safety rule and regulation. To make the interior facet of your glass façade just as shiny, the experts will depend on the usual ladder and sponge washing approach. As we garnered more and more positive responses from our clients, the need for window cleaning in Finsbury has noticeably skyrocketed in close by areas. You can go over the regions we've added in the list below. Alternatively, get a free instant quote or order affordable window cleaning services Finsbury EC1 online, through our web site.